These two workbooks provide effective exercises to improve and to strengthen the core elements in visual perception. Visual perception is one of the most basic and important skills required in order to learn to read, write, and do math. Often children with higher visual perception abilities have fewer problems in learning these subjects and being successful in school. Discriminating between colors, shapes, and sizes, comparing and contrasting, recognizing groups and patterns, associating objects based on logical relationships between them, differentiating left and right directions, and learning spatial skills are all covered in these two workbooks. 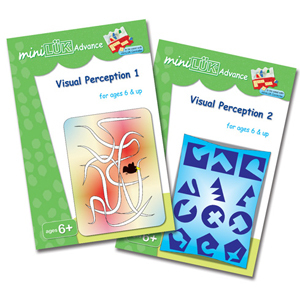 Visual perception and general learning skills are positively enhanced by completing these exercises.